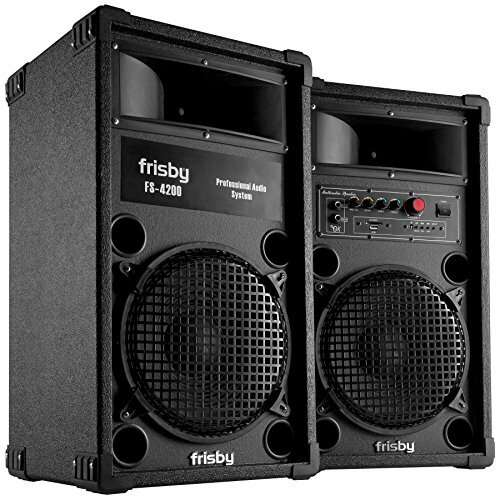 Frisby fs4200st speaker system was made to pump up the party. Play your favorite tracks as loud as you want and with style. Speakers feature impressive high-power output. Use them at home, on stage or in the auditorium. They're perfect for any get together and will make you feel like a true dj. Get the party going with the frisby fs4200st speaker system. The 10" (bass) speakers are housed in two cabinets with a rugged design to heavy use for parties, bbqs and any outdoor/indoor event. This system is a powerful all-in-one system for IOS devices android devices, MP3 players. The Bluetooth feature allows you to keep your iPhone, iPad or a Bluetooth enabled device right next to you while you blast away the fs4200st works with phones or tablets from popular brands like apple, Samsung, HTC, google, LG, Amazon, Nokia, Blackberry and more. Independently control volume and make adjustments to treble, bass and echo to fine-tune your sound. A built-in usb/SD port provides additional media to keep the party going. For your convenience, there are two audio inputs (standard 1/4") that can be hooked up with wired microphones. Fs4200st powerful speaker system also looks as good as it sounds. Turn on power button to "on", insert SD card or USB device to play MP3 format songs directly. Unit dimension each : 12" x 12.5" x 23", frequency response18 hz 20khz. If you have any questions about this product by FS-4200ST, contact us by completing and submitting the form below. If you are looking for a specif part number, please include it with your message.